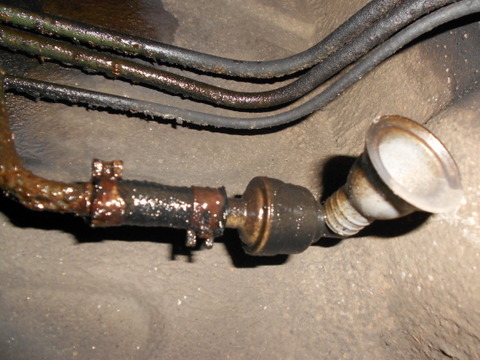 What is this valve and why is it dripping diesel? On my 83 300D? Or is it leaking diesel further up the chain? Under the driver's passenger's side. 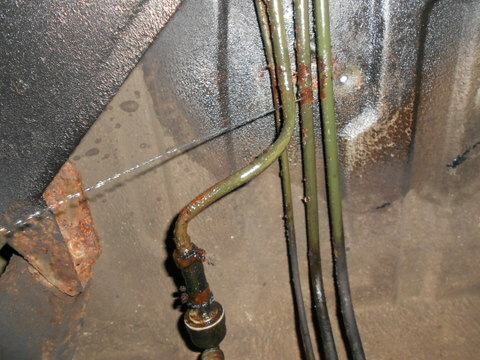 Is it leaking from diesel tank and running down the line? Thanks. Last edited by edge; 05-11-2012 at 12:52 PM. It's the vent line that allows air into fuel tank as fuel is used. Looks like all those lines are ready to leak significantly, based on the wetness and corrosion. Time to replace all of them. Agreed, it's the vent, fuel is running onto that from somewhere. Gotta get some rubber hose (what size??) , zip ties and inspect it over the weekend, arrggghhhh. There shouldn`t any fuel leaking out of the vent. 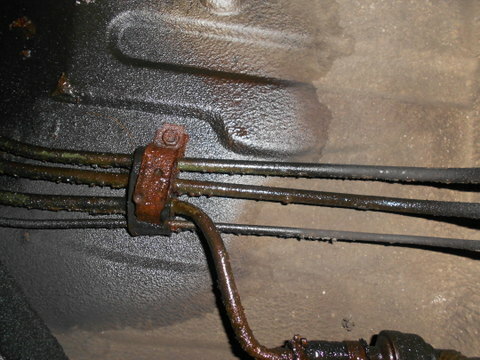 Iam thinking you might have a fuel line rusted through under the rubber where it is secured to the body. there is the supply line, return line and the vent clamped together. 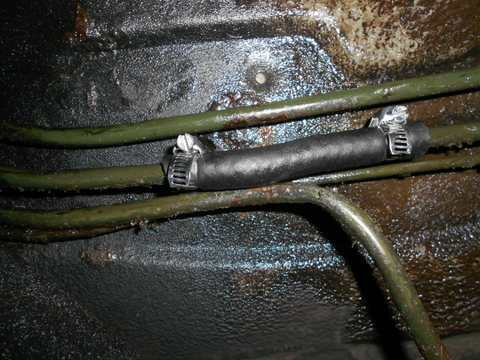 the brake line is also along there. Looking at your pics, the wetness is more concentrated towards the engine, not the tank so I don't think it is leaking from the tank side. 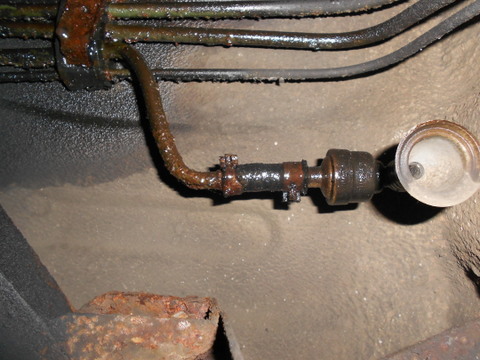 If I have to guess, it is leaking under the rubber of the clamp in your pics. Moisture gets trapped in there and caused a pin hole. Looking at your pics, the wetness is more concentrated towards the engine, not the tank so I don't think it is leaking from the tank side. Is the tank vent connected to the engine? Or is it connected to the tank? To tank. Did I get my orientation wrong? 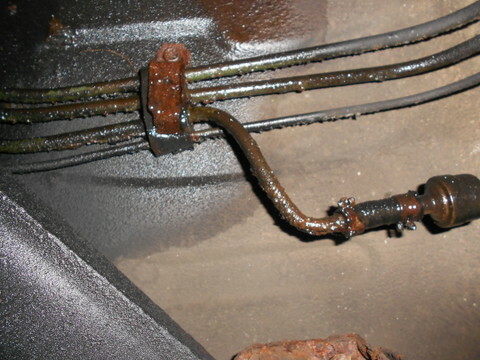 Still, under the clamp is a likely place for rust and leaks. Check the other clamps while at it. Edge: I had this same thing just run new lines front to back using those rubber coated straps for each line the tough part is where they come down from over the rear control arm. I just made short hose pieces with good clamps for that area. I used 3/8 soft tubing and it worked out well. Bingo! 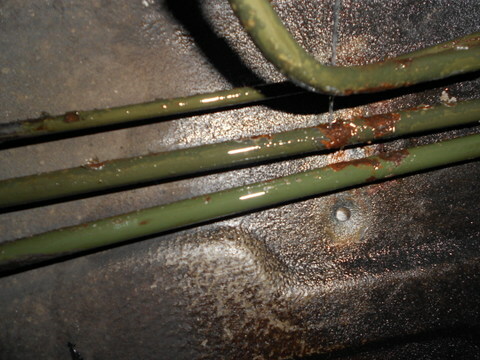 Right behind the rubber support is the rusty line and when I scraped it, the drip became a sprung leak. Now do I use a hacksaw to cut out a 2" section of line or just hacksaw the line and insert a 4" rubber hose and zip tie all along the rubber hose? It draining a couple of gallons so I sit and wait. Thanks. Last edited by edge; 05-19-2012 at 02:53 PM. Yes 5/16" ID Fuel Hose from the Auto Part Chain Store is also rated for Diesel Fuel. When I was working on my Rear Cross Member I had to detach the Fuel Tubing to the Tank from the Cross Member Clamp and move it out of the way so it would not get burned by the Welding. I evidently bent the tubing a little and developed a Pin Hole in a rusted area under one of the Clamps. The rubber under the Clamps was mussy so it may have acutally been leaking before but the Rubber sealed it. You might want to remove the Clamps and check under the Rubber to see if the Lines like mine are rusted under the rubber. Last edited by edge; 05-19-2012 at 10:05 PM. That should do it - well done!